Stuck for Christmas present ideas for the little ones? 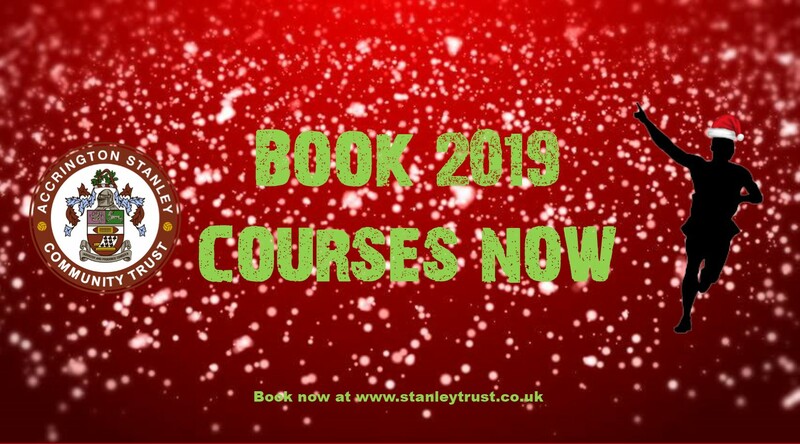 Then get yourself to our online store and treat them to one of our 2019 courses which are available to book now. Those that purchase a course before the 20th December 2018 will receive a gift voucher in the post perfect to be wrapped ready for the most famous man in red and white to deliver in time for Christmas. Book before the 20th of December 2018 using voucher code ‘XMAS18’ at the checkout and you will receive 15% off your booking. Football Development Centres (FDC) – are weekly coaching sessions for any ability aged 4 to 9 years old. Held at Accrington Academy on a Monday even 5.30pm till 7.30pm during term time. Our inclusive courses provide young players the chance to participate in an environment they feel comfortable in. Each week covers a different themed technique or skill, and then allows the opportunity for practice in small-sided matches during each session. Stanley Kickers – are weekly coaching sessions for those aged 2 to 4 year olds that have a love of football. They are parent friendly, child specific and provide an introduction to the basic skills of football. Each child works with their own ball and this enables them to learn to master ball skills from an early age. Held every Saturday morning during term time at 9.30am for an hour. Activity Club – these sessions run throughout the year during the holidays at Accrington Academy. Aimed at children aged 4 to 12 years old they allow children to safely participate in a wide range of activities from Performing Arts and Craft to Multi-Sports with lots in between! Soccer School – these sessions run throughout the year during the holidays at Accrington Academy. Topics cover a wide range of football related topics including, control, passing, dribbling, shooting, heading and match play for those ages 4 to 12 years old. Elite Soccer School – these sessions run throughout the year during the holidays at Accrington Academy. Our Elite Coaching Soccer Schools take place on state of the art 3G AstroTurf and all sessions are led by Accrington Stanley coaches working on behalf of the Community Trust with minimum UEFA ‘B’ coaching qualifications who work to a specifically designed technical program which is age related with the main emphasis on development and ball mastery.